When will it give it back? Let's talk for a second about manufacturing. It seems that everyone now bewailsthe decline in America's manufacturing base over the past half-century. You don't need to cite figures; you can just say our manufacturing jobs have been shipped to China/Mexico/India, and leave it at that. But this is only half the story. Manufacturing jobs have definitely dwindled miserably. But the actual manufacturing of stuff is another story entirely. Since peaking in 1979, total U.S. manufacturing positions have fallen by 40% -- a loss of some 8 million jobs. 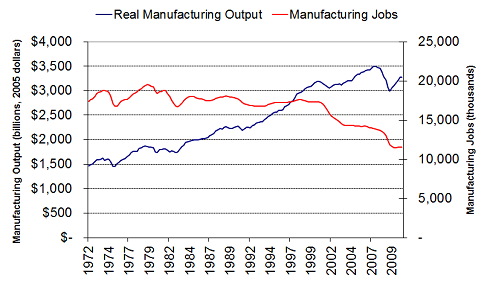 Real (inflation-adjusted) manufacturing output, however, has increased 75%. Sources: Federal Reserve, Bureau of Labor Statistics, author's calculations. I've mentioned before that the disconnect between manufacturing jobs and manufacturing mostly owes to productivity. Advances in manufacturing technology have allowed companies to produce more stuff with fewer workers, using machines to complete tasks once done by hand. Your jobs aren't just being shipped to China. They're being replaced by robots. In 1950, the United States Steel Corporation employed 30,000 workers at its plant in Gary, Ind. Today that factory employs only 5,000 workers. But they produce more steel: 7.5 million tons a year now, compared with 6 million tons then. This is technology eating jobs. Facebook is now valued near $100 billion, Twitter at $8 billion, Groupon at $30 billion, Zynga at $20 billion and LinkedIn at $8 billion. These are the fastest-growing Internet/social networking companies in the world, and here's what's scary: You could easily fit all their employees together into the 20,000 seats in Madison Square Garden, and still have room for grandma. They just don't employ a lot of people, relative to their valuations, and while they're all hiring today, they are largely looking for talented engineers. Is this a bad thing? I don't think so. For one, there are tech companies like Microsoft (Nasdaq: MSFT), Intel (Nasdaq: INTC), and Oracle (Nasdaq: ORCL) that collectively employ hundreds of thousands of people. More importantly, change is just what economies do. Today's laid-off factory workers were once replacing farmers, buggy makers, and inefficient micro-smiths. Nostalgia about the past usually overlooks advancement. Change, especially when driven by technological breakthroughs, is a wonderful thing. But there's a broader point to make about the trade-off between capital and labor. When economies grow, the benefits of that growth are split between two groups: capital (investors), and labor (workers). Fifty years ago, the benefits were skewed toward labor. Growing demand for goods meant more factory jobs -- fueled largely by America's status as the only major nation not reduced to rubble after World War II. Jobs were not only plentiful, but came with real wage gains as well. Capital (investors) did well too, but the real winners of the 1950s and '60s were workers. During the 1960s, disposable income increased faster than stocks. That trend began shifting in the 1970s as the balance moved toward capital. Productivity -- one of the most important measures of any economy's growth -- still boomed, but the benefits favored investors, and in many cases came at the direct detriment of labor. Rising productivity in the 1950s meant the 30,000 workers of U.S. Steel's Indiana plant got raises. After the 1970s, it meant they got laid off, while its shareholders benefited by producing more steel with fewer workers. That trade-off between labor and capital has been exceptionally skewed over the past two decades. If you have capital, and can invest in Facebook or own a hedge fund, things have scarcely been better. If you're an average worker, things have scarcely been worse. The question is how long that can last. Like all markets, the trade-off between labor and capital moves in cycles. In Ford's (NYSE: F) early days, founder Henry Ford provided what at the time were high wages because he reasoned that maximizing sales meant workers would have to be able to afford the cars they were making. There comes a point where capital can't prosper if labor is broke, and so the cycle shifts. But we haven't yet hit that boundary, and globalization makes doing so all the more difficult. When will the tide turn? Share your thoughts in the comment section below.